This tasty dish doesn't require much preparation and many of the ingredients will likely already be in your kitchen cupboard. Brush the chicken with 1 teaspoon of the oil, then sprinkle with the curry powder. Place the onion slices in a roasting tin and toss them in the remaining oil. Add the chicken, then place in the oven and cook for 25 minutes, until the chicken is cooked through and the onions are crisp, stirring the onions halfway through the cooking time. Meanwhile, rinse the rice, then put it in a pan with the water, cinnamon stick and a pinch of salt. Bring to the boil, add the raisins and stir once, then cover and reduce the heat. Gently cook for 10 to 12 minutes, until the rice is tender, adding the peas halfway through. 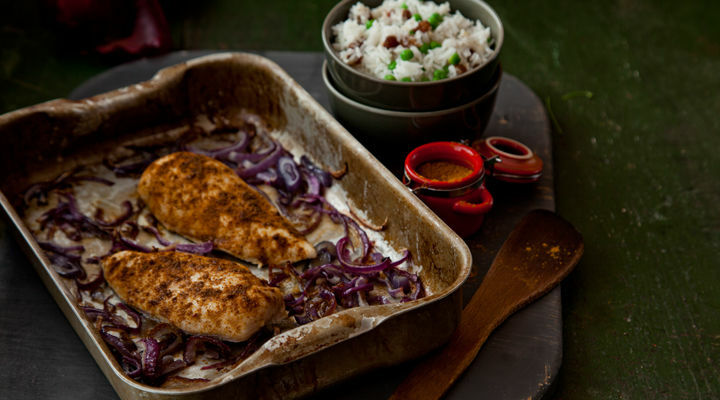 To serve, spoon the rice onto two plates, top with the chicken and scatter over the onions. Stir the herbs into the yogurt and season with salt and pepper before serving it on the side.